Are you into flea markets? Well, you might not know that there is a regular one in Helsinki taking place three times per week. 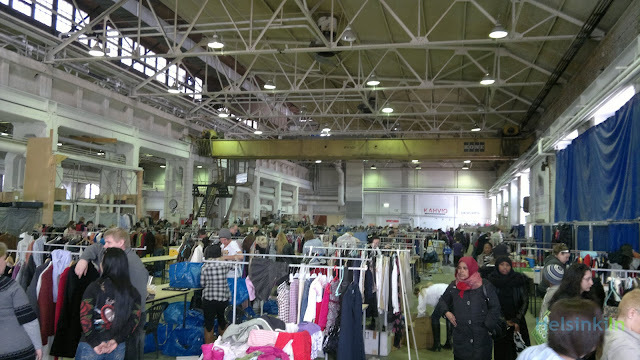 In an old storehouse in the northern part of Helsinki you find the Valtteri flea market. It takes place on Wednesdays, Saturdays and Sundays. On those days it is open from 9.00 to 15.00. If you are searching for second hand stuff this is the place you most likely find what you were looking for. Amongst lot of good and still usable products unfortunately people also try to sell stuff that can just be called trash. Most useless stuff you fill find in the dissolved household department. But of course you can also be lucky. Prices here are really low and it’s worth paying a visit. You get there easily with tram line 9. Good luck with getting good deals! Thanks so much for this blog! I am a Canadian citizen moving to Finland soon and your posts and photos have been very helpful in getting a taste for life in Helsinki.